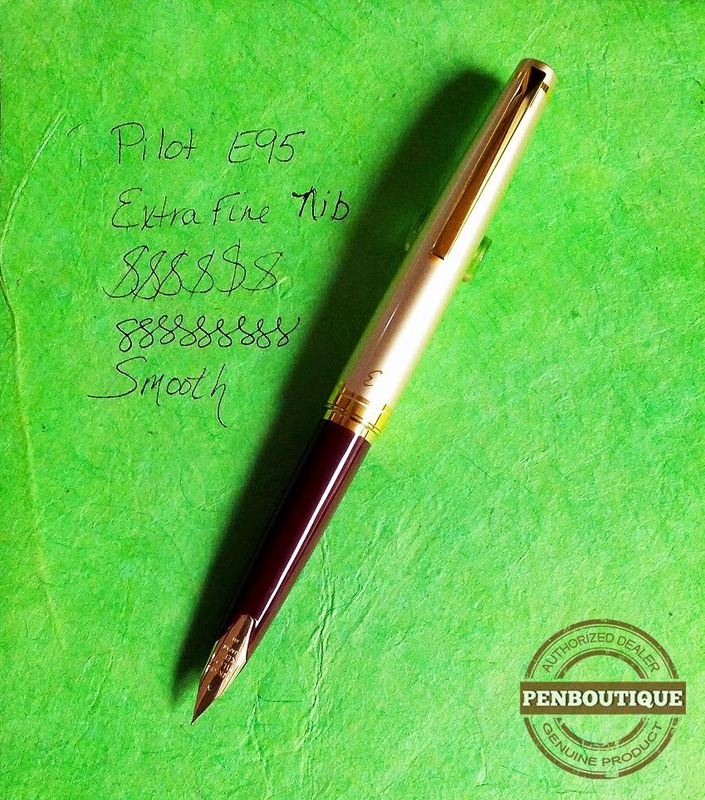 The Pilot E95 is the latest in a long line of 14k gold nib pens. It comes in two versions, black and burgundy/ivory, both with gold trim. The standard Black with Gold trim is nice, but the Burgundy/Ivory really caught my eye. It is a shorter pen, only 4.7" capped and 5.8" posted, but perfect for my hands. The pen would probably be too small for someone with large hands. It has that vintage look from the 1960s and still is very classy and sleek. The scripted "E" on the cap and the gold inlaid nib add to this look. The cap is threadless so I don't have to worry about unscrewing the cap every time. I can just pop it off, post and go. The pen accepts the standard Namiki ink cartridges and also comes with the Con-20 converter. I'm not a big fan of the Con-20 and so tried the Con-50 and Con-70, but both are too large to fit in this pen. The Extra Fine is very fine and so would be perfect for those who write small and fast. The Fine is super smooth and the Medium is a nice wet writer. The nib can be customized into many other options, including oblique. I used Noodler's Black ink on Lokta paper for my test run and was very pleased with it. The Extra Fine nib did not grab at the fibers in the paper, as I thought it may. It did not feather and was smooth and quiet while testing. I can't wait to continue to use this pen as I feel it may become my every day writer.